Supporting the school not only helps kids succeed -- it's also a great way to get your name in front of our active group of over 500 local parents. We will go the extra mile to ensure your business's investment in your community is recognized and promoted online, in our newsletters, and at our well-attended events. Our neighborhood's brand new public elementary school opened in 2010 at a temporary location in Wallingford. 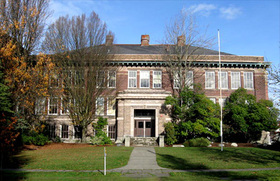 In the fall of 2012, renovations were completed in the landmark McDonald Elementary Building on Latona and 54th, and has opened - serving families from Wallingford, Green Lake, the University District, and surrounding area. Our historic mascot -- the Scottie dog -- rides again! McDonald Elementary was chosen by the school district to become an "international school." As an extension of the program pioneered at John Stanford, all elementary students are taught Math and Science entirely in either Spanish or Japanese. It's a unique opportunity to create a generation of children raised with global awareness. But for our kids to succeed learning Math and Science entirely in a foreign language, the language immersion program requires a second native-speaker in every classroom. It's a world-class opportunity for local public school children -- but there's a catch: the district doesn't fully staff the program. It's up to the community to raise the money. You can read more about the language immersion program's specific staffing requirements here. Every year, as the school grows, we need to raise more to pay the salaries of the essential Immersion Assistants in every classroom. McDonald International parents are your neighbors, customers, colleagues and fans. 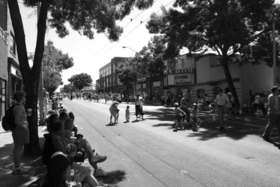 We know first-hand how a thriving neighborhood school strengthens the local business community. Stand tall with our growing community of hundreds of local families. Our online Scottie Booster Guide will feature all prominent donors and encourage hundreds of active McDonald families to patronize them. 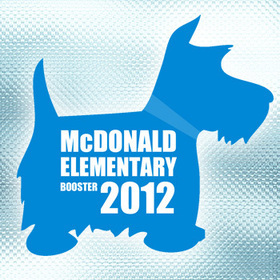 If you're a retailer, you'll also want to show off your Scottie Booster Window Sticker to highlight your generosity. You'll also want to be featured in our annual holiday local shopping guide at year's end. Our most significant donors will be recognized prominently on our website - and all businesses will be thanked with a link. Send us your logo! The website receives over 1,200 unique local visitors each month -- these are young families, Wallingford's most active, engaged demographic. Our most significant donors will also be recognized individually in our eNewsletter which is sent to our network of over 400 active subscribers. Get in touch for more details. These are tough times for businesses and for our public schools too. By giving as generously as you can, you'll be standing with your neighbors and your community, demonstrating your support for public education and helping our kids develop math, science and a global perspective that will make a difference for them -- and for us -- in the years to come. McDonald PTA is a 501(c)3 and your donation is tax-deductible. To give by mail or in person, you may download the form on the right. Or for more information contact our Fundraising Chairs. As a business donor, however you give, we encourage you to get in touch directly, to ensure your generosity is acknowledged. 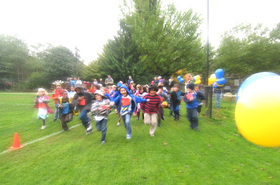 Thanks for supporting our neighborhood's unique, globally focused public elementary school. Your gift helps build a stronger community. Imagine a math classroom in which one person -- the teacher -- speaks only Spanish or Japanese. How do the kids learn math? The answer is to add a second native speaker to the classroom. That makes it possible for the kids to being modeling conversation and learning the language. -- but the school district does not pay for them. Download this form for more information - or just get in touch. Our Spring Fund drive is focused on raising cash to pay for next year's language staff. But we welcome in-kind donations from local businesses too!